Put on those skate shoes! – Even when wearing your flat shoes, you still fall and slip on the floor. Why be afraid of using something different like skate shoes? Lesson: Never dread changing your routine. Try something new. You might end up failing or not liking it at all but at least you tried and ‘what if’ will be the last question you will think of. Take small steps at a time – You don’t have to glide or dance right away, just relax and enjoy the thrilling feeling of doing it the first time. Lesson: Don’t hurry, just savor each moment. After all, life is not about knowing it all in just a snap. Learning takes a lot of time and patience. You need help – Admit it. 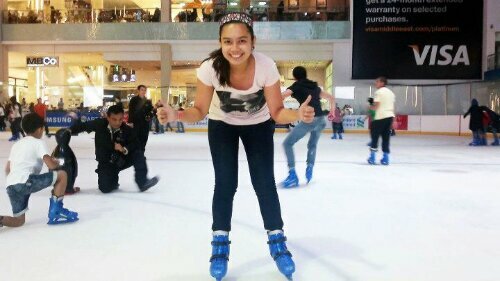 The first time you skate, you can’t keep away from the I-will-die-because-my-head-will- knock-on-the-floor feeling. 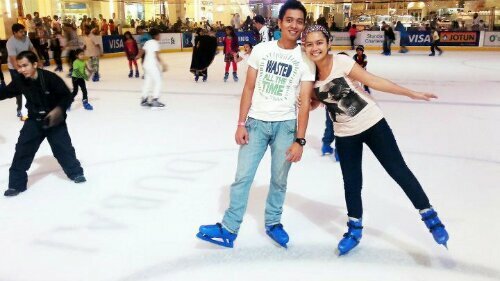 So go and ask somebody to hold your hand for a little while until you get used to the slippery ice. Lesson: From the day you were born, there was always someone guiding you (your parents, siblings, relatives, friends, teachers, co-workers, church, etc). “No man is an island”, Yes, it’s true. In every aspect of your life, you should have a support system who will teach you the right ways to make it through. Bring someone you love – It could be your family, friends, or partner. Holding the hands of a person you love will motivate you more than a stranger’s. At the same time, you can demand their whole time teaching you! Lesson: From the simplest to the most daring adventures, have someone to share it with. Doing things with people closest to your heart equates to the best times of your life! Say ‘Thank you’, ‘Excuse me’ and ‘Sorry’ – If a stranger tries to help you, smile and say thank you. Say excuse me when there’s someone blocking your way. And if you accidentally step on someone’s skate shoes, just laugh about your blunder and say sorry. Lesson: These three words are precious. They are very elementary yet we tend to forget them at times. Saying these simple words build healthy relationships, forgetting them ruins it all. Take some snap shots– Take pictures of the first step, first fall, and everything in between. Even the most embarrassing moments! Lesson: “Memories are the only paradise from which we can never be expelled”. These photographs will help you bring back old feelings you have taken for granted because of life’s stresses and difficulties. When feeling down and low, sit with your loved ones and look at each picture, reminisce those exceptional moments and feel the happiness you felt back then. It helps – a lot. Be crazy – Don’t feel embarrassed even if you are the oldest guy inside the rink, or if you fall many times. Here’s a hint: don’t mind other people because they don’t care about you. Lesson: These crazy things are the ones you will look back to when you grow old. These are the moments that will make you laugh the hardest– the moments you will trade anything for just to make them happen again. It’s not expensive, but it will still work – You may not have the nicest skate shoes but you surely are the best skater. Lesson: Your life is not defined by material things. It’s not even about your educational background, the job you are in, or your greatest achievements. Life will only be meaningful when you share it with others. As Morgan Freeman said, “you measure your life by the people who measure their lives by you”. You can’t do skating, but you can sing – Sure you tried your best but you still can’t find yourself gliding your way up to the center of the rink. Yet, you see your friends dancing and making cart wheels on their skate shoes. Don’t be upset, we were gifted with unique talents. Lesson: You are not perfect, so what? Our inability to do other things makes us appreciate others. Never compare, there will always be people greater or smaller than you. Be glad for what you have and explore your potentials. Go with the flow, follow rules – Go against other skaters’ path and you will find yourself banging with everybody. You can go faster or slower, but please, follow the same direction. Lesson: It might seem too conventional but the only way to survive life is to move forward as everybody does. 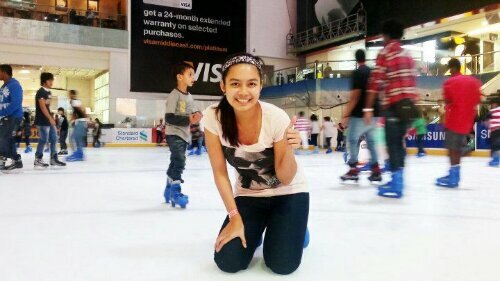 Let go – You will never learn to skate if you won’t let go from his/ her hand. Lesson: To be able to move forward, you have to let go of the things holding you back. It comes gradually, but you will eventually have the courage to do it. Trust yourself – Never say never. And if kids can skate, why can’t you? Lesson: In everything you do, have faith. Trusting yourself on something is way better than having a hundred lessons. If you don’t trust yourself, doing even the simplest task will seem impossible. Pay the price – Ice skating is not free, but it’s worth it. Lesson: We work hard for money so we deserve a taste of luxury once in a while. But remember to do everything in moderation. Know your limits and capabilities. Fun is over– Time is up! Return your skate shoes, go home and look forward to doing it again next time. Lesson: Happy times end, and so are the sad ones. That’s how the game of life is; you just have to play with it. Posted in Dubai, Dubai Guide, Love, random thoughts, weekendsTagged Dubai Mall, dubai mall ice skating rink, ice skating, Ice Skating in Dubai, What to do in Dubai MallBookmark the permalink. Reposting my very first blog I wrote 3 years ago! wow! Stay up the good work! You already know, a lot of people are searching round for this info, you can aid them greatly.